« No Public Engagement, Please. We’re Theologians! Was Paul Really Persecuted for Preaching a Crucified Christ? Was Paul persecuted for preaching a crucified messiah? In 1 Corinthians 1:23 we read that the message of “Christ crucified” was a “stumblingblock” or “offence” to the Jews. There is no explanation to inform us exactly why Jews were so offended by Paul preaching that a messiah had been crucified but that hasn’t prevented many readers from knowing the reason without any shadow of doubt. The assumption has generally been that the Jewish idea of a messiah was a superhero who would conquer the evil powers of the world and set up the Jewish people as the ruling kingdom over everyone else. 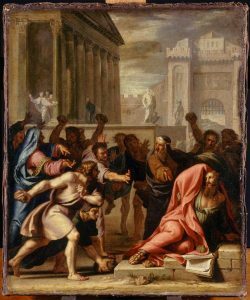 There is a further understanding that the Jews hated Paul enough to persecute him because his teaching about the messiah was so outrageous and offensive. Let’s try the prediction test on the latter of these hypotheses. If Paul’s crucified messiah really was a scandalous polar opposite (so opposite as to be virtually inconceivable or blasphemous to many Jews) to a standard messianic idea with which Jews as a whole identified, then we would expect to find Paul addressing that contrary messianic figure somewhere and making it clear why it was deficient and why his crucified messiah was indeed superior. Unfortunately we find no evidence of any such polemic. Paul’s writings nowhere hint of that sort of clash of views. And this is not surprising when we attempt to find out what the “Jewish” idea of a messiah actually was in the time of Paul. There was none. Or more correctly, there were several ideas alongside an apparent lack of interest in the idea altogether. Beside such instances where no messiah whatever is to be found in the text, there are a number of passages where the word “messiah” does appear, but refers to some anointed functionary who may have nothing whatever to do with the End, and in any case owes his title to a position quite other than that normally, in modern usage, called messianic. Thus, for instance, when the War refers to “thy messiahs” (in xi.7) the term probably means the prophets of the OT, as it sometimes does in the Zadokite Documents, and — if we follow Kuhn in thinking that these documents refer to two messiahs, from Aaron and Israel — it is altogether probable that the messiah from Aaron is the anointed High Priest. This variety of usage derives, of course, from the OT, where prophets and priests, as well as kings, are anointed, and the term “my messiahs,” equated with “my prophets,” is even used to refer to all Israelites. Now much scholarship has been published on the Qumran texts and messianic references since 1959 and I have filed a long list of related readings to catch up on. Nonetheless I would be very, very surprised indeed to learn that the overall picture of the state of messianic viewpoints among early first-century Jews and Jewish groups that Morton Smith outlined in 1959 has changed very much. Okay, so the term “anointed” (=messiah) was applied to a diversity of persons and offices. Not many of them have any association with “the last days”. Yet we all know what we really mean by “the messiah”, right? We mean the figure who is to make a dramatic appearance at the end-time. The Dead Sea scrolls include documents addressing the climactic events of the end time — the War and Thanksgiving scrolls and the Habakkuk commentary — but they disappoint our expectations of finding mentions of a Messiah. When we recall the Old Testament literature itself we should not really be surprised at this silence. Many passages in Isaiah, Ezekiel, Joel and the rest of the OT likewise portray the last days without any evident role for a Messiah. Examples: Isa 2 2-5, 25-27, 29 17-24, 30 18-26; Ezek 38-39; Joel 4; etc. Then we have the pseudepigrapha: the Book of Jubilees, Enoch 1-36 and 91-104, the Assumption of Moses, the Slavic Enoch, the Sibylline Oracles IV. These likewise avoid reference to an end-time messiah where we might expect him to appear. And of the early rabbinic literature? As for rabbinic literature, the comparative rarity of messianic references in the older material is notorious, and the independence of the terms, “the days of the messiah” and “the coming world” makes it possible that by some, at least, the one or the other may have been used exclusively. Certainly it is not safe to assume that the harmonization of the two concepts, which now prevails in rabbinic material, was customary and universal from the beginning. can hardly be taken as testimony for vivid eschatological hope. Now all this variety in the matter of messianic expectations is merely one detail — though a particularly striking one — of the even greater variety of eschatological expectations current in the two centuries before and after the time of Jesus. To say nothing of mere differences in personnel and program, these expectations run the whole gamut of concepts, from ordinary kingdoms in this world, through forms of this world variously made over and improved, through worlds entirely new and different, to spiritual bliss without any world at all. But the point to be noted is that these contradictory theories evidently flourished side by side in the early rabbinic and Christian and Qumran communities which copied the texts and repeated the sayings. What is more, quite contradictory theories are often preserved side by side in the same document — the Book of Enoch is a glaring example and was evidently a very popular one, since it was widely used by early Christianity and current in the Qumran community, too. For a description of the range of variation, and an attempt (admittedly unsuccessful, pp. 69 f.) to unscramble the several varieties, see P. Volz, Die Eschatologie der jüdischen Gemeinde (Tübingen, 1934), pp. 63-77. It is, I think, quite reasonable to imagine that some of Paul’s contemporaries agreed with his arguments while most disagreed. But it is not easy to imagine Jews of the day seeking to kill Paul over what many must have regarded as just one more variant perspectives. After all, Paul was by no means saying the messiah did not do messianic things. The argument was entirely over the means by which the messiah accomplished his great victory and salvation. In Morton Smith’s view what united Jews was their recognition of a common source of authority for the law. That did not mean that all Jews agreed on every jot and tittle. They obviously didn’t. But the common acknowledgement of the source enabled them to debate the details as a community. This is where Smith believed Paul’s personal security ran into difficulties. Smith explains Paul’s teaching on the law this way. No one can keep the law perfectly. So the effect of the giving of the law was to turn people into ignorant transgressors to knowing and therefore culpable sinners. God therefore gave the law to turn men to Jesus for salvation. People are freed from the law by the magical ceremony of baptism. Baptism enabled converts to identify vicariously with the death and resurrection of Jesus. The law has no claims on one who has died. So death (baptism) sets one free from the law. Liberated Christians could still keep the law in order to avoid offending others or to win converts, but this was of course “mere pretense”. Here we may well have grounds for real offence. One can imagine charges of hypocrisy and libertinism surfacing. So what does Smith make of our famous passage in 1 Corinthians 1:23 that says the Jews were scandalized by the teaching of the crucified messiah? It is true that he once refers to his preaching of “a crucified Messiah” as “a scandal to the Jews” (I Cor. 1:23) without stopping to explain why it should be so. And it is also true that this verse has been made the hair on which to hang mountains of nonsense about Jewish resistance to the substitution of a spiritual Saviour for a military Messiah. But the actual Jewish indifference to vagaries of Messianic speculation has been noticed above, and it requires that another explanation be found for I Corinthians 1: 23. And as for me, brethren, if I still preach circumcision [as I did when a Pharisee], why am I now persecuted? All those who want to make a good appearance in the flesh, they compel you to be circumcised, only in order that they may not be persecuted for the cross of the Messiah. These opponents were Christians; they must have been preaching that Jesus was the Messiah; there is no indication that they denied his crucifixion (and had they done so, Paul certainly would have attacked them for it). So they, like Paul, were preaching a crucified Messiah. Therefore the verse must indicate that they could do so with impunity, provided they took care to pretend to observe the Law; i.e. provided they did not draw, from Jesus’ death, Paul’s conclusions. Posted on 2014-08-02 07:30:42 GMT+0000 by Neil Godfrey. This entry was posted in Biblical Studies, Paul and His Letters and tagged Born of a Woman, Messiah, Morton Smith, Paul. Bookmark the permalink. We know from the Bible itself that Jews had lots of different beliefs. We know that Jews in Jerusalem would mourn for the death of a god who would then return to life. According to the Bible, this mourning by Jews about the death of a god would take place literally at the Temple in Jerusalem. OK, this was quite a bit before Paul, but it shows that it is just plain wrong to say that no Jews would contemplate X , where X is contrary to mainstream Jewish beliefs. Jews had very diverse beliefs. Which of course, casts lots of doubt that Josephus, even if he wrote the Jamesian Passage as is in our extant text, referred to James as “the brother of Jesus who is called Christ” as anyone except Jesus BenDamneus. (Ant. 20.200) At least IMHO. This is the sort of stuff that makes me think that Christianity originally started out as a sort of Jewish mystery religion. Since there was no clearly defined “messiah” role before and during Christianity’s inception, there might have been a lot of free reign/interpretation on what “the messiah” meant. It seems like a pretty constant human trait to latch onto something that is ambiguous and relatively unimportant in a mainstream ideology and then structure an entire belief system solidifying the “true nature” of that ambiguity, and then forming a group of like-minded individuals establishing insider vs. outsider knowledge. Modern examples would be things like Scientology, 9/11 truthism, anti-vaxxers, etc. While Josephus doesn’t use the word “messiah,” I know you are aware that he says the 66-70 CE war was started by Jews who were inspired by “an ambiguous oracle that was also found in their sacred writings, how, about that time, one from their country should become governor of the habitable earth. The Jews took this prediction to belong to themselves in particular, and many of the wise men were thereby deceived in their determination” (War 6.5.4). Josephus could say that “the Jews” in general took this prediction of a “governor of the habitable earth” to belong to themselves, even though not all of them were for the war or necessarily messianic, because the revolutionary doctrine that began in 6 CE and led up to the 66-70 CE war had infected “the nation … to an incredible degree” (Ant. 18.1.1). Even if we suppose that the messianic aspect of this doctrine only began in 66 CE, that would still be fairly close to the time of Paul, given the uncertainty of the year of his death and the tradition that he lived to at least 62 CE. And it’s not hard to imagine that this earth ruling “governor” idea was on the minds of “the Jews” before the war started, given that it was based on their sacred writings, which already exhibit an awareness of the idea of a world conquering ruler without much need for interpretation. “[B]y the hand of the prophet Zechariah, ‘Awake, 0 Sword, against my shepherd, against my companion, says Cod. Strike the shepherd that the flock may be scattered and I will stretch my hand over the little ones’ [Zech. 8:7]. The humble of the flock are those who watch for Him. They shall be saved at the time of the Visitation whereas the others shall be delivered up to the sword when the Anointed of Aaron and Israel shall come” (CD col. 7). But if Paul, according to M. Smith, was persecuted because the concept ”crucified messiah == freedom from Torah to all”, then why Paul persecuted the JudeoChristians lovers of Torah, before his conversion ? How Smith explains this point? Good point. Smith points out how vague Acts is about the reasons for the persecutions of the Christians. In the case of Paul’s own persecuting Smith seems to suggest that the reason was that Christians were declaring a “passible man” as the “Son of God” (used as a messianic title). This would cohere with Paul’s response to the vision — he asks for the Lord to identify himself. After his own sight was restored we read that Paul’s message was that Jesus was indeed the Son of God (Act 9:20). Crucifixion does not surface in the process of Paul’s conversion. I don’t think we need to be too worried about the historical plausibility of this explanation since Acts is so implausible as history in many other ways, too. Luke is presenting Paul as a persecutor as a theological and plot device and is taken from Euripides Bacchae and the Heliodorus episode in 2 Maccabees. I don’t think there is any other reason (outside Acts) to think Paul ever engaged in persecution of this nature. The references in Galatians do not require Paul persecuting the church in the sense of dragging people off to prison and torture or death in neighbouring kingdoms. I’m reading the Tom Dykstra’view about the Messianic Secret in Mark in his book Mark, the canonizer of Paul. I know that for William Wrede is Mark 9:9 the key to understanding the Messianic Secret in Mark: only after the resurrection it’s possible to know who is really Jesus. Wrede’s view is simply the strongest explanation of all. But even his theory can be refined better if we define what is the sense of that ”after the resurrection” in a Gospel where any description of resurrection is absent. It is only a temporal moment: it follows the resurrection but it is not caused by resurrection in a cause-effect relation. Then I think that, ”after the resurrection”, i.e., at end of reading all Mark, only the esoteric reader can recognize, behind the irony of Cross, that it’s the Crucifixion the true revealer of Jesus Messiahship in Mark. All this fits perfectly with the emphasis of Paul on Crucifixion (that abolishes the Torah, as it’s very well explained in this Neil’s post). What do you think? Am I correct? If I understand you correctly I agree. Yes, it’s the crucifixion that is the glorification (and presumably by inference the revealer) of Christ. In Mark 10 it is the crucifixion that is interpreted as “the glory” of Christ. ”those who love him” becoming in Mark ”those with ears to hear”. can you help me with a few questions? 1. is it true that paul could have been persecuting christians even though he didn’t know what they believed? 2. is it true that people who persecute others may be ignorant of what they believed in ?